Borderlinx | Buy Shoes and ship worldwide with Borderlinx. Cheap rates guaranteed. Each season, Shoes offers customers cutting-edge fashion from the best brands including Steve Madden, Michael Kors, UGGS and more on its online shop. Shoes has a pair for women, men, boys, girls, babies and even hard-to-find sizes from premium labels like Timberland, or Converse so everyone can find his perfect fit. At Shoes.com the new products arriving on a daily basis and the regular clearances will satisfy all shoes addicts! 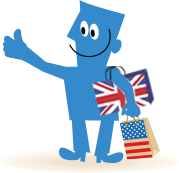 Now with Borderlinx, international customers can buy fromShoes the USA, and Borderlinx will ship your order cheap right to your place ! With Borderlinx, shipping, tax & duties are estimated in advance with our Shipping cost calculator, and services such as concierge, free repacking and consolidation services available to make international ordering from Shoes hassle-free!